Last week I was gruching about a scene that was giving me trouble to my aunt, and she said, “You know, you don’t have to do this if it isn’t fun anymore.” For a moment, I just stared at her. Just because I’m complaining about writing being difficult doesn’t mean I want to throw in the towel. The idea of stopping never even crossed my mind. 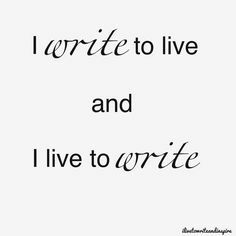 As with many writers, I don’t write because I want to please my fans or make money off it but because I feel compelled to. It’s a compulsion, an itch that can only be silenced by reading and writing. During the semester when graduate school has taken over my life, I feel the unmistakeable misery of not being able to scratch that itch and write (usually I end up foregoing reading for class and write a bit throughout the day). From the time I was about ten years old, I have been writing stories. Over the years, the amount I write has waxed and waned depending on my circumstances, but it has been present over the last thirteen years. When I was in high school, I had a few lousy English teachers who killed my love of writing and reading to the point that I never thought of becoming an English major in college. Creative writing was kept under the wraps since I didn’t write about teenage-appropriate topics like sports, romance, and angst. If the guidance counselor saw my stories full of epic battles or the one about a young woman who deals with her friend’s suicide attempt, I would probably would have been sent to counseling. Somehow I feared college would be the same. It wasn’t though. I went into college as a biology major with dreams of becoming a doctor who specialized in reconstructive surgery, and honestly, I did well in my biology classes and even earned an award from the department. In my freshman year, I met a wonderful professor who happened to be the head of the English department. She took me under her wing and nurtured my insecure talent until finally in the second half of my sophomore year I chose to double major in English as well. During my time as an undergraduate, I contributed to the school’s literary magazine as well as worked on it, was a writing tutor, and spoke at two literature conferences (one on scifi and fantasy and one on Medieval literature). Much to my father’s dismay, becoming a doctor faded away the moment a Norton anthology was put in my hands. I finished my degree in biology but immediately applied to a graduate school with an MFA program in creative writing. While biology could have provided me with a stable income should I have pursued it, I knew I would have been miserable. I needed to write, I needed to read. It pulled me and compelled me and was the one thing I did that felt completely natural. Call me hedonistic, but my life has been guided by what makes me happy and so far it has worked for me. My mom has a job that pays well, but she isn’t truly happy there. If I see how doing what is expected can lead to misery, why should I follow the trail of money if I do not have to? My question is, do we do what makes us happy or do we try to live up to the status quo? Making a “safe” choice is no guarantee of success. Life is short and you only get one. Better to do what you love. As long as it’s legal and doesn’t hurt anyone. I completely agree. Being an ax murderer because it makes you happy isn’t going to work, but if you would rather write than be an accountant, I say go for it.